Strathearn Girls School in Northern Ireland has been faithfully supporting our kids for four years now. In fact we’ve come to look forward to a phone call from teacher Mr Stevenson each year requesting a car load of Jerry cans. And it’s so encouraging to hear a few weeks later that because of those Jerry cans, enthusiastic pupils and devoted staff £1,768.70 can be raised! That was the very impressive total raised this year by Strathearn pupils, raising the grand total since 2013 to a whopping £6,000! Every day, millions of children throughout the world spend countless hours collecting unsafe water in Jerry cans weighing the equivalent of 20 bags of sugar! 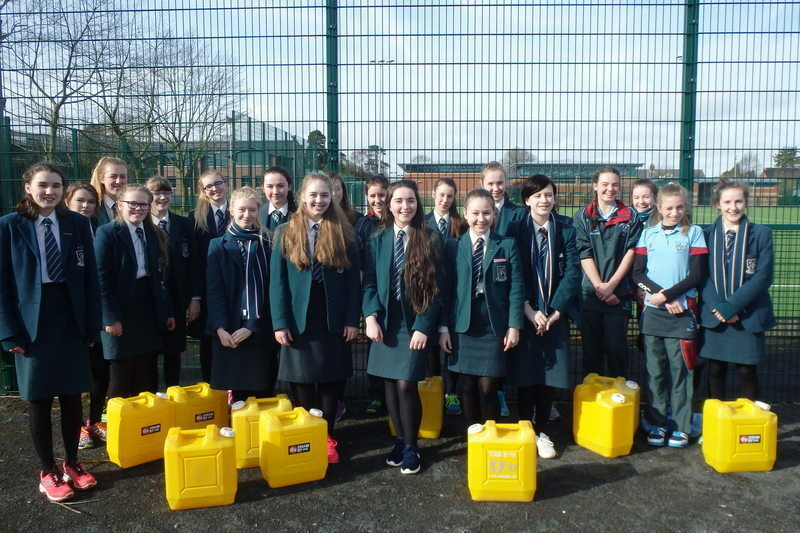 The “Walk a Mile in my shoes” challenge involves pupils getting sponsored for carrying Jerry Cans for one mile. It is a great opportunity not only to empathise with the children in our care for whom this is a daily struggle, but also to make a difference to their lives, and the lives of their families. The activity is extremely flexible and works with individual classes, year groups, or even as a whole school event – from nursery age to senior school. The money raised by the “Walk a Mile in my shoes” challenge is used to construct and deliver water filter systems to the homes of the children who attend Stand by Me’s schools in Ethiopia. None of our children have running water in their homes and they have to collect their water from polluted streams. The fantastic fundraising over the years by Strathearn pupils has given the gift of clean water to many families and transformed their health. Better health means that parents are well enough to go to work and provide for their children, and children are healthy enough to go to school, gain a great education and reach their potential. Ketty has a brave heart but she’s struggled with a medical condition that has limited her ability to walk. Her small family home was detrimental to her health. So, we rebuilt her house fully equipped with wheelchair access and a wet room. One year on from the Nepal Earthquake and we remember your amazing response that allowed us to source our first supplies of aid within days of the earthquake.